Somewhere along the way, I picked up the language of “argument repair.” I don’t think this is my term, but borrowed from others. Many people have found it the most interesting concept in my analysis of textbook treatments of fallacies. Some textbook authors have asked for sources, and some instructors have developed their own exercises. I have only found one scholarly discussion of it, and no articles aside from mine, but in critical thinking and argumentation studies it’s quite common for innovative scholarship to be presented in textbook form. (A great recent example of this is Maureen Linker’s Intellectual Empathy: Critical Thinking for Social Justice — I plan to post on that soon.) Richard Epstein’s Critical Thinking (Thomson Wadsworth) devotes a chapter to the argument repair, and perhaps that’s where I picked up the term. It’s no longer in print, unfortunately, but you can find a discussion of it here. This rich depiction of argument as war is far from what I want, and yet conflict is certainly part of the dialectical picture. What interests me is that the audience allows the speaker the opportunity for argument repair. The speaker can take “to the field” and “retire” in turns. The premise is more plausible than the conclusion. If the argument is valid or strong, we may delete a premise if doing so doesn’t make the argument worse. The conclusion is clearly false. None of this indicates a dialectical context, so it’s interesting that they choose terminology different from the traditional “charity.” So, it seems that I need to look closer at my own past practice to see if I’m doing anything different, and have made explicit my interest in the dialectical context. I’ve also sent out some inquiries to people who might know better than I, and I’ll report back. The aspects of fallacies presentation that support the Adversary Method, in increasing order of concern, are as follows. (b) 50% or more very short or decontextualized examples. (d) A “taxonomic technique” for exercises that provides a range of arguments as mistaken and asks students to indicate which fallacy creates the mistake; or presents a range of arguments that may or may not be mistaken but does not include discussion of acceptable counterparts of fallacies. Those textbooks not on the table because they do not exhibit three or more aspects of the Adversary Method include those by Bickenbach and Davies (1997), Epstein (2006), Govier (2010), Johnson and Blair (2006), Tindale (2007b), all who have significant bodies of scholarship in argumentation and informal logic. Boss (2010) is another exception, a scholar of moral reasoning who engages feminist issues. Almost all authors on the table have no publications in informal logic or argumentation. (To assess the authors’ scholarly areas I consulted the current on-line edition of The Philosopher’s Index and the authors’ academic webpages). Only three philosophy textbooks—Walton, Woods, and Irvine (2004), Copi and Cohen (2005), and Engel (2000)—that my analysis reveals to employ the Adversary Method (and so that appear on the Table) have authors who are scholars in the field; and even these are borderline cases. 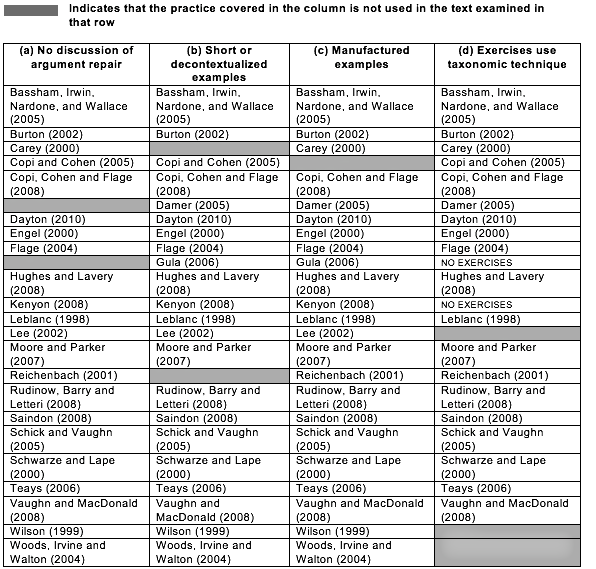 The worst practice, the taxonomic technique, does not appear in Walton, Woods, and Irvine (2004), and many longer, contextualized, and authentic examples can be found in Engel (2000). Engel’s (2000) and Copi and Cohen’s (2005) belong to an early generation of textbooks, which accounts for their failure to reflect recent scholarship. Bassham, G., Irwin, W., Nardone, H., and Wallace, J.M. (2005). Critical thinking: A student’s introduction. Toronto: McGraw-Hill. Bickenbach, J.E. and Davies, J.M. (1997). Good reasons for better arguments: As introduction to the skills and values of critical thinking. Orchard Park, NY: Broadview. Boss, J.A. (2010) Think: Critical thinking and logic skills for everyday life. New York: McGraw-Hill. Burton (2002). The voice of reason: Fundamentals of critical thinking. New York: Oxford University Press. Carey, S.S. (2000). The uses and abuses of argument: Critical thinking and the fallacies. Mountain View, CA: Mayfield. Copi, I.M., and Cohen, C. (2005). Introduction to logic, 12th edition. Upper Saddle River, NJ:Prentice Hall. Copi, I.M., Cohen, C., and Flage, D.E. (2007). Essentials of logic, 2nd edition. Upper Saddle River, NJ: Pearson. Damer, T.E. (2005). Attacking faulty reasoning: A practical guide to fallacy-free arguments, sixth edition. Belmont, CA: Wadsworth. Dayton (2010) Critical thinking, logic, and argument. Pearson Education Canada. Engel, S.M. (2000). With good reason: An introduction to informal fallacies, 6th edition. Boston: St. Martin’s Press. Flage, D.E. (2004). The art of questioning: An introduction to critical thinking. Upper Saddle River, NJ: Pearson. Govier, T. (2010). A practical study of argument. Belmont, CA: Wadsworth. Gula, R.J. (2002). Nonsense: A handbook of logical fallacies. Mount Jackson, VA: Axios Press. Hughes, W. and Lavery, J. (2008). Critical thinking: An introduction to the basic skills, 5th edition. Peterborough, Ontario: Broadview. Johnson, R. H. and Blair, J.A. (2006). Logical self-defense. New York: International debate education association. Kenyon, T. (2008). Clear thinking in a blurry world. Toronto: Nelson. Leblanc, J. (1998). Thinking clearly: A guide to critical reasoning. W.W. Norton & Co.
Lee, Stephen P. (2002). What is the argument? Critical thinking in the real world. New York: McGraw-Hill. Moore, B.N. and Parker, R. (2007). Critical thinking, 8th edition. New York: McGraw-Hill. Reichenbach, B.R. (2001). Introduction to critical thinking. New York: McGraw Hill. Rudinow, J., Barry, V.E., Letteri, M. (2008). Invitation to critical thinking, 1st Canadian edition. Toronto: Thomson. Saindon, J. (2008). Argument and argumentation. Toronto: Nelson. Schick, T., Jr. and Vaughn, L. (2005). How to think about weird things, 4th edition. New York: McGraw-Hill. Schwarze, S. and Lape, H. (2000). Thinking Socratically. Prentice Hall. Teays, W. (2006). Second thoughts: Critical thinking for a diverse society, 3rd edition. New York: McGraw-Hill. Tindale, Christopher. (2007b). Fallacies and argument appraisal. New York, NY: Cambridge University Press: 155-170. Vaughn, L. and MacDonald, C. (2008). The power of critical thinking, Canadian edition. Don Mills, Ontario: Oxford University Press. Wilson, D.C. (1999). A guide to good reasoning. New York: McGraw-Hill. Woods, J., Irvine, A. and Walton, D. (2004). Argument: Critical thinking, logic and the fallacies, second edition. Toronto: Prentice Hall.